Replacing missing teeth is essential to keep your smile healthy and functional. Even a single missing tooth can wreak havoc on your oral health. When a tooth is lost, the surrounding teeth shift to fill in the gaps, causing misalignment, loss of supportive tissue, strain on the TMJ, and other serious oral health concerns. For those patients with numerous missing teeth or a full row of lost teeth, these oral health issues are compounded. Unfortunately, traditional tooth replacement options can cause damage to remaining healthy oral structures. 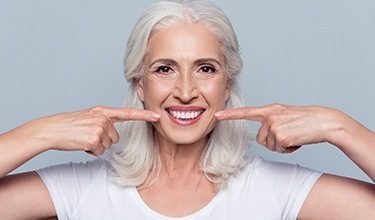 Traditional dentures, for example, put increased pressure on gums and bone tissue, leading to the loss of supportive structures and changes in facial shape. Implant supported tooth replacement solutions help to address many of these health concerns because they replace both the roots and crowns of missing teeth. For patients who need to replace a full row of teeth, implant supported dentures aren’t always a good solution because they require a large amount of healthy supportive gum and bone tissue to achieve successful implantation. Luckily for Carrollton dental patients of DD Family Dentistry, we offer a viable alternative to traditional implant supported dentures – All-on-4. The innovative All-on-4 tooth replacement technique allows our skilled dentistry team to leverage the naturally stronger parts of your jaw to support an entire denture on just four implant posts. Ready to get started? Call our Carrollton dental team to schedule your All-on-4 consultation today. We’ll examine your smile, and help you find the right tooth replacement solution. All-on-4 dentures, as is implied by the name, are full arch tooth replacement prosthetics that are supported by just four implant posts. Unlike traditional dental implant supported dentures that require support from implant posts placed along the entire width of the jawline, the All-on-4 system uses the denser portions of the jawbone at the front of the mouth to support the entire denture. One of the benefits of All-on-4 treatment is that more patients than ever before are eligible for tooth replacement with implant supported restorations. However, before you begin an All-on-4 treatment plan, there are some things you should keep in mind. This tooth replacement solution still requires that patients be in relatively good overall health. If your doctor does not think you are healthy enough for even a minor surgical procedure, you struggle with immune compromising illness, or you take certain medications, you may not be a good candidate. If you have had negative surgical experiences in the past, dental implant tooth replacement options may not be right for you. If you don’t have the ability to devote the time or money to completing this extended treatment process, a less complex tooth replacement solution may be better for you. The DD Family Dentistry team is dedicated to helping patients prepare for and successfully complete All-on-4 treatment. Please feel free to talk to us about any of the above concerns. They don’t necessarily mean you are not a candidate for this tooth replacement option. We may just need to make adjustments in our treatment planning process to accommodate your needs. What Should I Expect During the Treatment Process? For the most part, the All-on-4 denture process works like traditional dental implant denture treatment. The main difference in the treatment plan is in the unique positioning of the implant posts. During your dental implant placement procedure, we’ll insert two implant posts vertically to support the front of the denture. The other two implants are placed diagonally from the back of the mouth to front, supporting the back half of your denture. For some patients, we can immediately attach a lightweight, temporary denture on the same day your implants are placed. For patients with significantly diminished gum tissue or jawbone density, we will need to wait three to six months for the implants to fuse with the supportive structures. In the meantime, you may be able to use a traditional removable denture. How do I Care for My All-on-4 Dentures? Following the placement of your All-on-4 implant denture, you can brush teeth as usual, using a minimally abrasive toothpaste and soft toothbrush. You should brush for two minutes at a time at least twice a day, and for best results, we encourage patients to brush between meals as well. While you won’t be able to floss your All-on-4 denture, you may still want to use specialized flossing tools or water flossers to remove plaque buildup between the denture base and the gums. When this plaque is not removed daily, it can harden into tartar (calculus). Overtime, this acidic plaque and tartar can damage your gums and cause the implants to come loose. 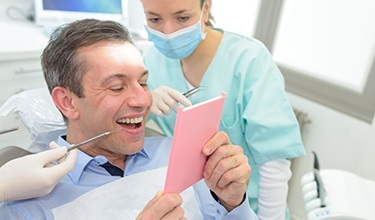 During your treatment planning process or any dental exam, one of our knowledgeable dentistry team members will be happy to demonstrate proper brushing and flossing techniques for your All-on-4 denture to help you keep your smile healthy. Patients with All-on-4 dentures also need to visit our office at least twice a year for exams and cleanings. For some patients, we may recommend more frequent checkups for the first few years after completing treatment to ensure the implant posts remain fully implanted and the dentures are functioning flawlessly. If your All-on-4 prosthetic ever feels loose or your bite doesn’t seem to fit together the same way, please call our team immediately. In some cases, we are able to make minor adjustments to help you save a damaged or failing All-on-4 denture, but the sooner we see you – the better. How Long do Implant Dentures Last? Traditional dentures need to be replaced every five to seven years to ensure the stability and longevity of your tooth replacement prosthetics. 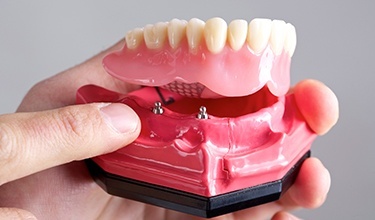 Implant dentures remain fully functional for two or more decades with proper care, and many patients end up keeping their All-on-4 denture for the rest of their lives. Call Us Today! (972) 245-3395	Have Questions? Get Answers.